Tucked away on a quiet street in downtown Evanston is the Eve J. Alfillé Gallery & Studio, a sparkling jewel box of a space dedicated to handcrafted jewelry that takes inspiration from nature, history, and philosophy. Owner and designer Eve Alfillé makes each piece by hand alongside her team of talented craftspeople, revealing a new design series every six months for her discerning clientele. While French-born Alfillé has excelled at many other ventures in her past, including time spent as a stockbroker, teacher, and archaeologist, it is her incarnation as jewelry designer that has most captured her fiercely passionate personality. Celeste Sotola, a multimedia artist and space designer, created four special areas to make this vision a reality: the Pearl Room, Gem Room, Diamond Room, and Wedding Band Alcove. The Pearl Room, situated in the front of the gallery, is home to an impressive array of pearls and books on the subject of that elegant gemstone. 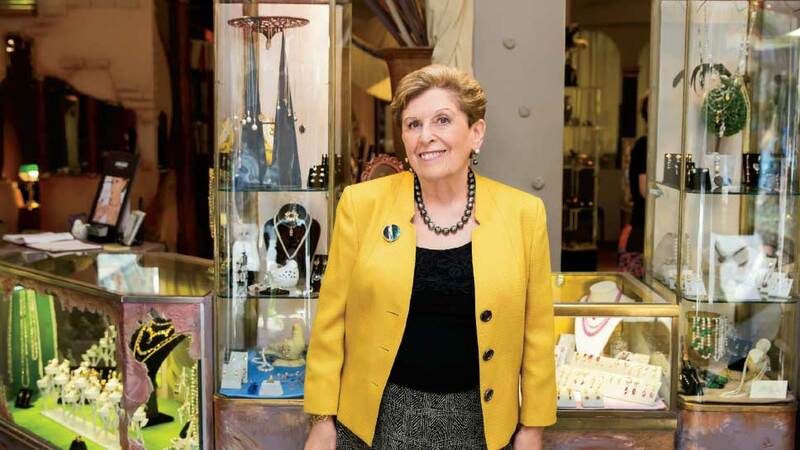 Alfillé herself is a font of wisdom when it comes to pearls: in 1990, she founded the Pearl Society, dedicated to sharing information about the classic gem, much like DeBeers’ ‘4 Cs’ for diamonds. The Gem Room recalls tales from the Arabian Nights, with its dazzling array of color and abundance, while the Diamond Room is a far more intimate, and darker, space. In the Wedding Band Alcove, couples can explore ring options under a romantic canopy, finding the perfect fit to symbolize their love. With this sense of customer appreciation, collaboration, and great design, the gallery is fêting its 30th Anniversary with a party on November 4 as well as a new collection of fine jewelry aptly titled “In Great Spirits” in honor of this grand celebration. The event is sure to entertain, with shopping, “delights of the vine, and other tasty spirits,” Alfillé’s daughter, Diane, gallery vice president and resident glass artist, assures. According to Alfillé, there is something magical about jewelry: “It’s like a prayer or meditation—it reminds us of the beauty of nature, of something that transcends the brutishness of daily life.” It is for that reason that she believes when it comes to jewelry, you should travel beyond imagination; beyond your usual reach. And we know just the place. Eve J. Alfillé Gallery & Studio is located at 623 Grove Street in Evanston. For more information, call 847-869-7920 or visit evejewelry.com.